No matter how many times I travel to the Continent, I can’t resist perusing the local market for beads. I am a bead-a-holic after all:-). On my trip last month, I visited some of my usual stomping grounds as well as some new ones in Ghana. 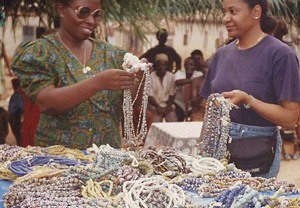 Many of you may know that Ghana is known for its powdered glass beads as well as metal beads using the lost wax method. 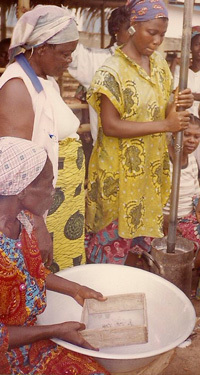 The beads are made in clay molds in which a stem of a cassava leaf is placed. The mold is filled with finely ground glass that can be built up in layers in order to form sequences and patterns of different shapes and colors. 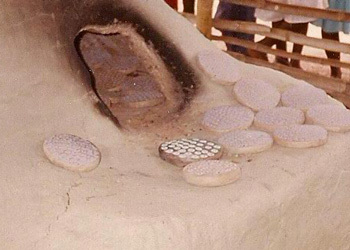 Once the coloring and pigment are added to the glass, the molds are fired in a kiln until the glass fuses. During firing, the cassava leaf stems burn away, leaving a hole for stringing. 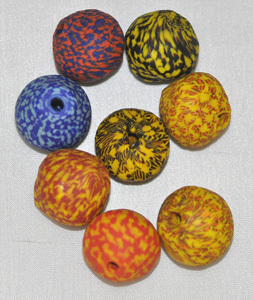 Certain powder glass bead variants, however, receive their perforations after firing, by piercing the still hot and pliable glass with a hand-made, pointed metal tool. Translucent glass beads: Fused glass fragment beads which are being made by fusing together fairly large bottle glass or glass bead fragments. 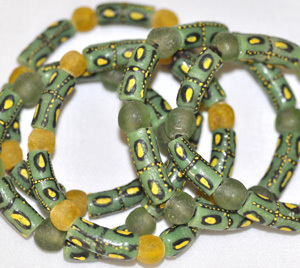 These beads are translucent or semi-translucent and receive their perforations, as well as their final shapes, after firing. Powder glass beadscomposed of two halves (usually bicones, occasionally spheres) that are being created from pulverized glass. The two halves are being joined together in a second, short firing process. The “Painted Beads” or “Writing Beads,” are made from finely ground glass, with glass decorations that are “written” on and fused in a second firing. 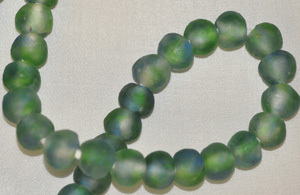 The multi-colored beads are the "painted" beads; the solid colored are "transparent." Please visit both and support those who continue this African handmade tradition. In the meantime, I’m going to have a ball designing with my new beads.